A key distinction between ZK MVVM and ZK MVC implementation wise is that we do not access and manipulate the UI components directly in the controller(ViewModel) class. In this post, we'll see how we can delegate some of the UI manipulation to client side code, as well as how to pass parameters from View to ViewModel. Build an update function to our simple inventory CRUD feature. 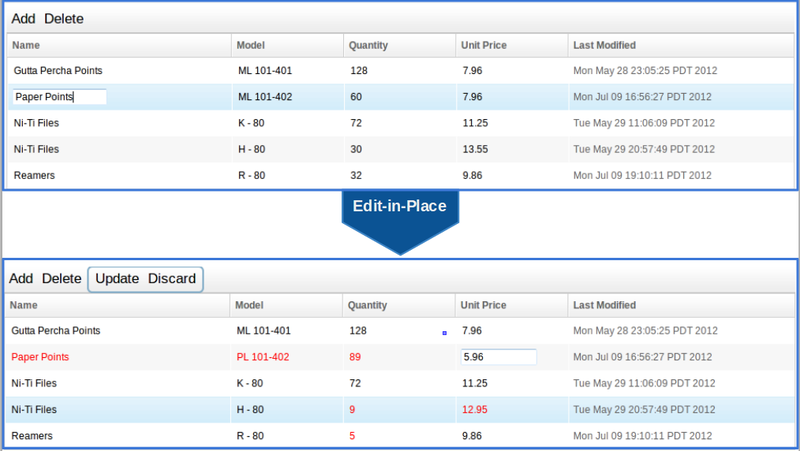 Users can edit-in-place entries in the table and given the choice to update or discard the changes made. Modified entries are highlighted in red. Once an entry is edited we want to give users the option to Update or Discard the change. line 18~20, we get all the input elements by matching their sclass name and assign an onChange event handler. Once the value in an input element is changed, the Update/Discard buttons will become visible and the modified value will be highlighted in red. line 6, we specify the client namespace so we can register client side onClick event listeners with the syntax "w:onClick". Note we can still register our usual onClick event listener that's handled at the server simultaneously. Next up, we'll go over a bit more on ZK Styling before we tackle the MVVM validators and converters. Sir, may I have your project ? I need more refences to improve my skill in ZKoss.